Hollywood frequently stresses that piracy not only hurts the major studios, but also smaller independent productions. While that may be true, for many independent artists obscurity is actually a bigger problem than piracy. This idea is also shared by Lee Gardner, the Director and co-writer of the film “Adopting Trouble.” A digital copy of the film came out on Amazon this week where it can be rented for $0.99 or brought for $4.99. The problem is, however, that people have to notice the film first. That’s a tough job when there’s virtually no marketing budget available. This is why Gardner and his team at Rare Legend Films decided to reach out to RARBG, one of the top torrent sites. Realizing that pirates will get their hands on the film anyway, he sent the film’s master files to the site, whose in-house release group FGT turned those into torrents of varying qualities. The releases come with a special note from Gardner himself, who explains why his production company took this unconventional step. “The thing they never tell you when you are making your film is that you won’t have enough money for marketing and without it, no-one will see your film. Maybe torrenters can fill that gap and spread the word on independent films,” he writes. The director sees torrenters as trendsetters. This is why the film came out on RARBG before the official Amazon release. While there are no obligations, a donation or plug are welcome of course. “So we are giving it to torrenters a little earlier than anyone else. If you like our movie. Please donate. Throw us a clam, a shekel or two. Tell your friends, your family and everyone you know,” Gardner adds. Other filmmakers have shared their work on torrent sites in the past, and it’s always interesting to hear their motivations. Especially when they work directly with a site such as RARBG. Speaking with TorrentFreak, Gardner says that RARBG was the only site he reached out to. The director was already familiar with the site and knew that it displayed a list of newly released movies, so it was a good fit. The reason is simple as well; it’s all about exposure. “The worst thing for an independent filmmaker is if no one ever sees their film. We had a micro-budget for our film and it was mostly out of our own pockets with no interest from distribution companies since we have no name talent involved,” he says. Without a marketing budget and knowing that the film would be pirated anyway, they felt like they had nothing to lose. That said, Gardner certainly isn’t arguing that piracy helps the movie industry as a whole. However, it’s a reality that they have to deal with. “I wish piracy didn’t exist but I don’t think it will ever go away. Our little three-man production company certainly doesn’t have the means or the time to go after people the way Hollywood does,” he says. The effects of piracy can vary but so can the motivations of pirates. Gardner doesn’t believe everyone pirates because they refuse to pay. In part, it’s a sign of anti-establishment, but also skepticism about what’s being offered. “I think many people are hesitant these days to spend money on movies, even Hollywood offerings. When I take my family of five out to the theater it’s hard if the movie is a letdown,” Gardner says. For independent films, there is even more hesitance. People often have no clue what to expect. They often don’t know the directors, writers or actors. So there might be room for innovation there. One option would be to allow people to watch the beginning of a movie for free, so they can decide whether it’s worth their money or not. “We need to find solutions to ease that hesitancy and better support independent filmmakers. One solution could be a platform where a potential customer can see the first 20 minutes of a film for free,” Gardner notes. 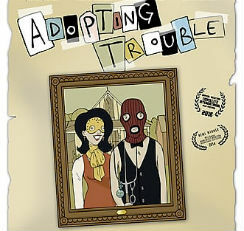 As for “Adopting Trouble,” people can watch it entirely for free on RARBG and other torrent sites where it was uploaded. Those who like it can choose to make a donation or grab a copy on Amazon. It will be interesting to see whether the torrent release delivers the exposure Gardner hoped for. If that’s the case it might be worth repeating in the future. That would also depend on other factors of course, as a sanctioned torrent release may be harder to pull off with outside investors in the project.